Tobii Glasses 2, the next generation wearable eye tracking tool, gives researchers the ability to capture truly objective and deep insights into human behavior in any real-world environment. Tobii Glasses 2 shows exactly what a person is looking at in real time as she or he moves freely in a shop, a restaurant or any real-world environment. The discreet, ultra-lightweight design with unobstructed side view ensures natural behavior and research validity. Reveal what catches attention and interest. Understand indiviual perception of the world and what drives decisions. Capture spontaneous responses that are unfiltered by the conscious mind. Observe accurate and precise visual behavior in real time. 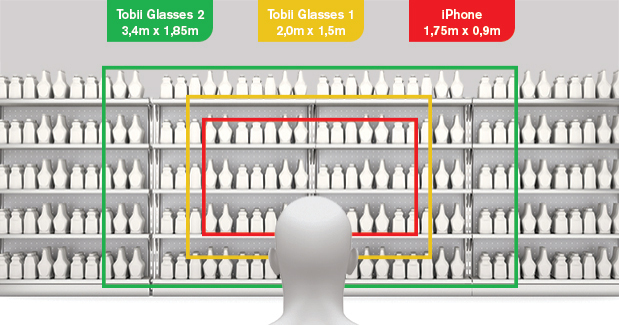 Tobii Glasses 2 enable eye tracking studies to be conducted in real-world environments, such as stores, and subjects to interact freely with physical objects or other people. Their unobtrusive design ensures natural behavior and research validity. The Tobii Glasses 2 Eye Tracker is available for purchase or rental. Tobii Glasses 2 is designed for use in the real world. Our design team created the ultra-lightweight and unobtrusive head unit to make sure test persons feel comfortable and act naturally anywhere. The head unit weighs only 45 grams. Live View allows researchers to see exactly what a person is looking at, wirelessly and in real time, and therefore gain immediate and actionable insights. It’s easy to use and affordable, yet it’s a very valuable research tool —ideal for many types of studies. Capturing genuine human behavior is quite a challenge. To examine viewing behavior, including peripheral viewing, that is as natural as possible, you need to offer the respondent a completely unobstructed view. We call it True View. Tobii Glasses 2 captures more of the scene. 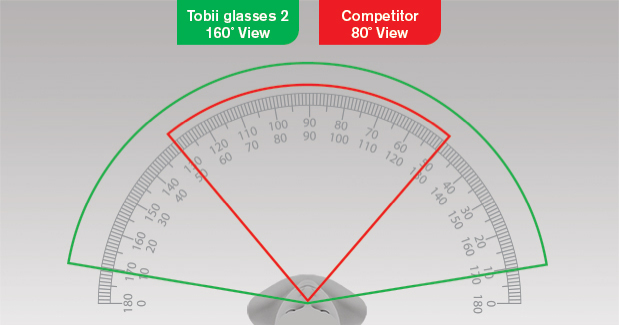 Tobii Glasses 2 supports natural viewing behavior. Robust eye tracking on all eye types. Minimum loss during extreme eye movements. Another benefit of Tobii’s proprietary technology is slippage compensation in case the head unit moves slightly on the wearer. By combining this slippage compensation technology with the sampling rate of 50 Hz for each of the four eye cameras, researchers will be able to collect more data with even higher validity. This tool helps researchers aggregate and process data from tests involving multiple subjects or objects in any environment, such as a second screen or a store shelf more quickly and easily. It significantly reduces video coding time. Our focus on user-centric design has resulted in ease of use and efficient workflows in every detail. Quick calibration and system-guided procedures make it easy for anyone to start using the system with little prior training. The system tracks a vast majority of the population which helps reduce field time and overall research projects costs. Eye tracking glasses capture what the subject sees and record subject comments. The head unit weighs only 45 grams, is discreet and provides maximum freedom of movement for the test participant to accommodate genuine human behavior. The Recording Unit records eye tracking data and saves the data to an SD card. This pocket-sized unit allows the test participant to move around unrestricted. The analysis software is a powerful post-analysis tool for researchers who want to look beyond live viewing. The software includes a semi-automated mapping tool, which helps researchers to more quickly and easily aggregate and process data from tests involving multiple subjects or objects in any environment, such as a second screen or a store shelf. The mapping tool significantly reduces time for coding videos. Generate powerful visualizations and calculate statistics.